Columbia Harbor House represents an alehouse in colonial New England. It’s located directly across from the Haunted Mansion at Magic Kingdom. Columbia Harbor House can be a great haven during the summer months. The dark wood interior and ample seating make it easy to find a place to rest in some much-needed AC, while enjoying a delicious meal. Columbia Harbor house is a very popular location and it’s easy to understand why. Columbia Harbor House is open for lunch and dinner. The menu is seafood heavy but don’t let that scare you away. There are some other great options. Classic fried seafood is a staple here. Fish and Chips, as well as Shrimp and Chips are very popular options. If you don’t care for seafood the ever-popular Disney chicken strip is available. They also have combination plates of these items so you don’t have to pick just one. Fried food isn’t your thing? No problem! Chicken Pot Pie, Grilled Salmon, Salads, and Sandwiches are also available. The lobster roll is probably one of the most popular items on the menu. In recent years Disney has really upped their game at quick service locations and now it’s easier than ever to find delicious options all over the parks. They also have two vegetarian options at Columbia Harbor House with the Vegetarian Chili and a Lighthouse Sandwich. The sandwich sounds delicious, its hummus, tomato, and broccoli slaw on a multigrain bread. I think I know what I’m getting the next time I go to Columbia Harbor House. Desserts are limited and will typically be a seasonal cobbler and Boston cream pie. We’ve never been to Columbia Harbor House without it being packed. The lines to order food are always congested. Often it can be hard to distinguish where the line even begins. As in they have a cast member directing you where to go. We recommend using the MyDisneyExperience app to order in advance. Annual pass and DVC discounts will not be applied to your purchase if you are using the App. However, we easily saved at least 30 minutes of our time by not standing in line. Since we ordered our food in advance (usually when standing in line for haunted mansion) we waited less than two minutes to pick it up after arrival. Sitting on the second floor is always our preference because for some reason other guests always forget about it and there is a lot of open seating. One thing we appreciate at Columbia Harbor house is how large the tables are. It’s also easy to find a high chair here, which for us is always a win. Adolfo ordered the very popular lobster roll. This is a very simple dish, lobster, mayo, lettuce all served on a hoagie style bun. You can pick a side to go with this but Adolfo chose to stick to the house chips. All in all this was a solid choice, it wasn’t too heavy and the sandwich is very filling. His only complaint is there wasn’t enough lobster! The house chips are also super good. Poor Adolfo didn’t get too many of his chips because Kaitlyn and I kept on stealing them. I (Elyse) got the Chicken Pot Pie. It was pretty good. It’s a small pie crust filled with chicken chunks, peas, carrots and potatoes with a cream sauce. It’s also sprinkled with bread crumbs. For the seasonings it tasted like they relied on a lot of poultry seasoning (which is fine with me I love that stuff) but if you aren’t too partial to sage and thyme you might find the flavors a bit strong. The Chicken Pot Pie is delicious but…I wouldn’t get this on a hot day. It was also very rich and I couldn’t finish it. I would maybe get this for dinner in winter if we knew we would be heading out of the park soon. We recommend avoiding this dish if you are planning to ride something like Space Mountain after eating. I paired it with a side of green beans, which really helped cut how rich the Chicken Pot Pie was. 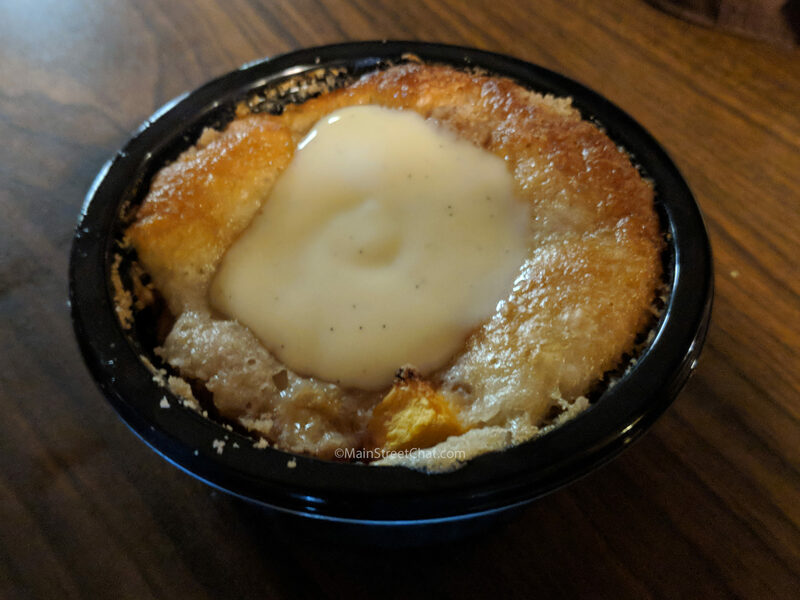 For dessert we got the peach cobbler and the best thing we can say about it is meh. It was very dry, and all breading. I think there was maybe two actual pieces of peach in it. We really can’t recommend it. We recommend eating here if you have a Haunted Mansion fast pass around lunch time. You can order while waiting in line and then tell it you are there while walking over from the attraction. We also think this is a great option if you are looking for more than just a burger. To View Columbia Harbor House menu click here. 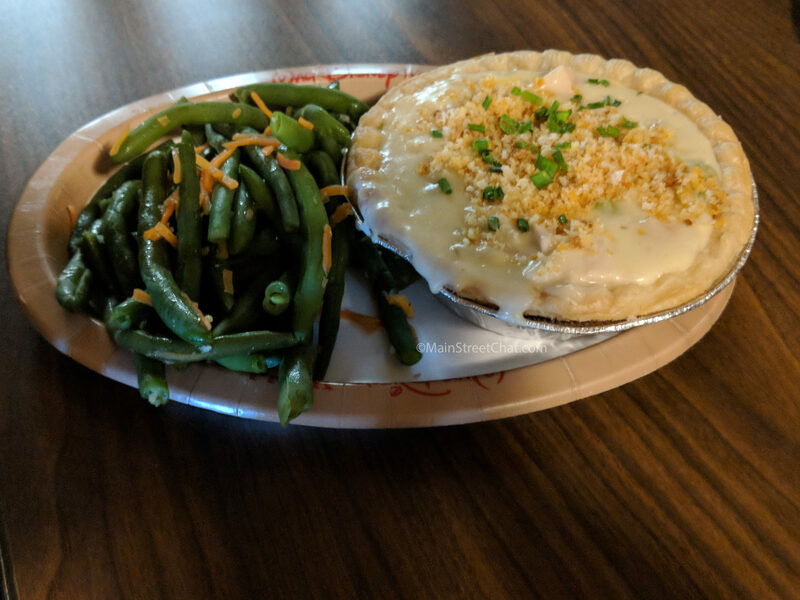 Also located in Liberty Square, click here to read our review of Liberty Tree Tavern. 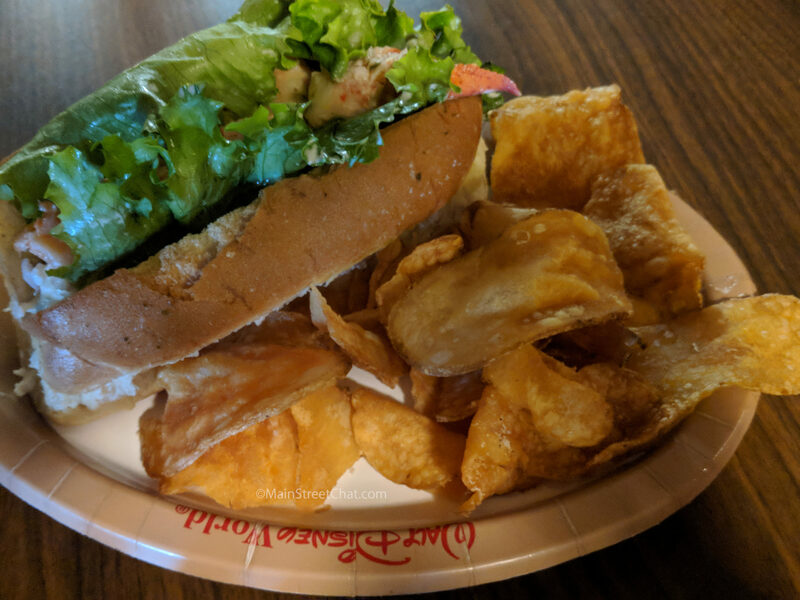 Prefer Character Dining at the Magic Kingdom? Click here to go to our Crystal Palace Dining Review. Have you eaten at Columbia Harbor House? Comment below to let us know what you thought or to make recommendations. Thanks for reading!